The fine fraction of soils in arid and semi-arid regions can be readily suspended into the atmosphere by winds and transported long distances, carrying potentially toxic elements (PTEs) associated with these source materials. 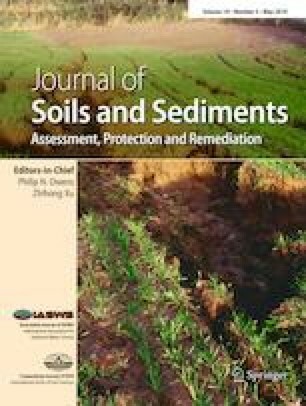 In this study, environmentally available PTE loadings for As, Cd, Cr, Cu, Ni, Pb, V, and Zn were measured in the fine fraction (< 75 μm) of 19 bulk soil samples collected in 2007 from 4 sites in Iraq and 15 sites in Kuwait. Soil samples were mechanically sieved and particle size distribution in the fine fraction was measured using laser diffraction particle sizing. Major and minor element composition was determined in the soil fine fraction using energy-dispersive X-ray fluorescence. Sub-samples were digested using strong acids and analyzed using high-resolution inductively coupled mass spectrometry to assess the maximum environmental availability of PTEs in each fine fraction of each soil sample. Measured environmentally available PTE loadings were normalized to soluble iron to allow for an assessment of soil contamination at and between sites that included weathering effects and was more focused on the mobile fraction of the total PTE load. Physiologically based fluid extractions were also performed on select samples to assess potential bioavailability of PTEs through ingestion and inhalation. Results show significant PTE loadings and anthropogenic contamination in the fine fraction of soils from Iraq and Kuwait. All sites showed moderate-to-high Ni contamination but loadings and contamination levels for all PTEs varied among sites in Iraq and Kuwait as a function of weathering, local geology, and inputs from non-local and/or anthropogenic sources. PTE contamination tended to be higher in the fine fraction of soil collected at the sites in Iraq, and the lowest overall PTE loadings were found at sites in northern Kuwait where the mean measured particle diameter was largest. Potential bioavailability of PTEs via inhalation was generally low (< 10% of loading) but a significant portion of the PTE load for As, Cu, and Pb (and V and Zn at select sites) was available via ingestion. The fine fraction of soils collected from Iraq and Kuwait in this study had significant environmentally available PTE contamination. Sites from Lower Mesopotamia in Iraq were the most impacted. PTE loadings and contamination were strongly influenced by local-scale weathering and geology, proximity to urban PTE sources, and inputs from non-local and/or anthropogenic sources. Sites with a smaller mean particle diameter had the greatest levels of PTE contamination. Potential bioavailability of PTEs was generally low. Thanks are owed to many people including Richard B. Coffin, Lewis C. Millholland, Tomasz Leski, Baochuan Lin, Anthony Malanoski, and David Stenger currently or formerly at the US Naval Research Laboratory, Washington, DC, USA (NRL Code 6114 and 6900); Katrin Monecke and Tempestt Morgan of Wellesley College; and Kathleen McCarthy of the Harvard University School of Public Health. Special thanks is owed to Michael J. Gregory (LCDR, USN, formerly of NRL 6114) for providing the soil samples for this study. This research was supported in part by the NRL (Codes 6114 and 6900) and the US Office of Naval Research.